By Janene Scully, Noozhawk North County Editor | @JaneneScully | November 28, 2016 | 6:09 p.m.
Christmas celebrations with parades and more begin in Santa Barbara County this week. 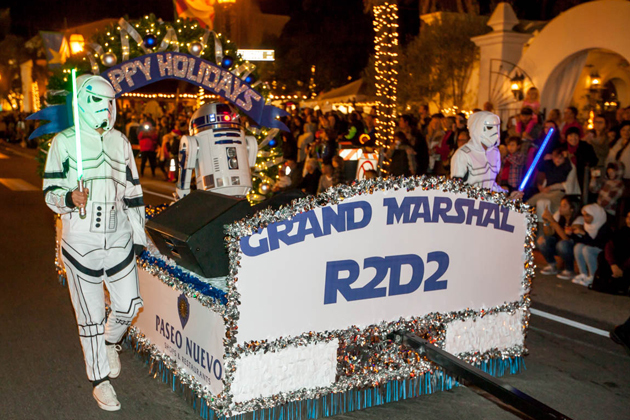 Kicking off the season will be parades in Santa Barbara and Lompoc on Friday night, with more happening Saturday and next weekend, including the 31st Annual Santa Barbara lighted boat parade Dec. 11. The 64th annual Downtown Santa Barbara Holiday Parade will begin at 6:30 p.m. Friday on State Street. The procession will start at State and Sola streets and end at Cota Street. The theme of this year's Downtown Santa Barbara parade is "Holiday Under the Sea," and the grand marshals are Cody and Caleb Walker, brothers of the late actor Paul Walker. The parade, presented by Consumer Fire Products, Inc. and other sponsors, is expected to draw thousands of spectators to see marching bands, holiday-themed floats, performance groups, local personalities, and more. Also Friday, the Lompoc Valley Children’s Christmas Season Parade will start at 6 p.m., moving south on H Street to Ocean Avenue. Portions of H Street and Ocean Avenue along the parade route will close to regular traffic from approximately 4 to 7 p.m. Friday. H Street will be closed between North Avenue and Ocean Avenue, while Ocean Avenue will be closed between E Street and J Street. This weekend, Solvang will launch its multiple-week Julefest celebration with a community tree-lighting ceremony at 5 p.m. Friday in Solvang Park, followed the next day by the Julefest parade at 11 a.m. The 2016 Julefest will celebrate the multi-generation Nielsen family, Solvang residents, community volunteers and owners of Nielsen’s Market as grand marshals. A full list of Julefest fun is available here, with the celebration culminating in the Christmas tree burn. Also Saturday, the Santa Maria Parade of Lights will fill Broadway from Stowell Road to the Santa Maria Town Center mall. Parade entries begin traveling along the route at 5:20 p.m.
Broadway from Enos Drive to Main Street will be closed at 4 p.m. Saturday. A segment of Stowell Road from Depot Avenue to Broadway will close at 3 p.m. since entries line up on the roadway. The Rotary Clubs of Santa Maria Valley and Nipomo have organized the Santa Maria procession since 1995, with the theme "The Joy of Giving" reflecting the call for spectators and participants to bring canned food items for the Salvation Army. More parades are planned for the second weekend of December. The 55th annual Old Town Orcutt Christmas Parade will start at noon Dec. 10, rain or shine, organizers said. Organizers encourage spectators and participants to bring canned food or other nonperishable food items to donate to the Foodbank of Santa Barbara County. The parade is expected to include up to 80 entries. This year's theme is "Christmas in Orcutt" and Jerry Luis as grand marshal. The Milpas Community Association's Christmas Parade will be at 5:30 p.m. Dec. 10, starting at Canon Perdido and Milpas streets and going down to Mason Street. It will have children's groups, classic cars and live performances, organizers said. The theme of this year’s parade is "Santa Claus is coming to town." The parade is being presented by the Goleta Old Town Community Association and the Goleta Valley Community Center plus community volunteers. Also on Dec. 10, Guadalupe will celebrate the season with a parade set to start at 6 p.m. on Guadalupe Street, also Highway 1. The annual Santa Barbara Parade of Lights at the Santa Barbara Harbor on Dec. 11 will start at 5:30 p.m. when 20 to 30 boats travel along the Santa Barbara coastline. Santa’s Village activities start at 3 p.m. on the city pier, and a short fireworks show is planned at 7 p.m.
Best viewing locations include Stearns Wharf and the breakwater, city officials said. Communities without parades plan to hold holiday celebrations such as the Los Olivos Olde Fashioned Christmas on Dec. 3. — Noozhawk North County editor Janene Scully can be reached at jscully@noozhawk.com .